This morning I received some awkward emails that I didn’t understand at first. After some silence on my part (being in a time-zone not awake yet) another email came in before I woke that explained the nature of the inquiry. A firearm manufacturer with a well known name was inquiring about purchasing the tooling and machines from MSAR for thier firearms and related products. Somehow my brief write-up on MSAR caught their attention and they mistook my site as the seller of the equipment. I received so much appreciated attention from The Firearm Blog and Reddit, it took me awhile to scan all the emails*. I called the inquiring company and straightened out the details. With MSARInc.com posting only their closing press release, I was able to provide a little more contact information than what was listed as just tooling@msarinc.com. Since this was a mistake on their part, I didn’t feel it was ethical to give up their name. Falsely attributed to George Orwell, but meaningful nevertheless, this quote came to mind, “Journalism is printing what someone else does not want printed; everything else is public relations.” Regardless, I’m not going to take advantage of a mistake, especially since said company may not be the name that purchases it in the end (assuming someone finds the pricing reasonable enough to buy). The important detail here, is there are interested parties looking at continuing production. Hopefully the new manufacturers try to compete with Steyr by concentrating on calibers other than 5.56mm. If I were the one handling the new company’s acquisition, I’d concentrate on caliber conversions, for the MSAR STG-556 and Steyr AUG series. I would concentrate on support for the latter, letting Steyr work out reliability and tolerances of the firearm, to concentrate on making quality conversions. This would primarily limit production to barrels, bolts, and firing pins. Starting with support for the NATO stocks (where STANAG magazines for different calibers is readily available) and eventually bring AUG type magazines for other calibers to market. 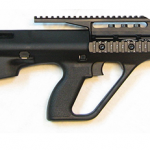 Possibly also making replacement stocks and grips in various colors, with the intention of allowing people to take their collector AUG-A1 stocks off to protect them as collector’s pieces and still use the firearm unafraid of scratches. * I do not understand why I have frequent emailers rather than people just commenting on my posts, maybe my reader base is more private? 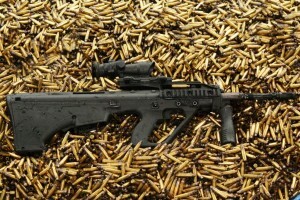 The End of MSAR (And Some Notes On Models That ..
Microtech Small Arms Research (MSAR), manufacturers of a USA made ..
GunDoll performing field strips on the AUG A1, MSAR STG-556, ..
Microtech Small Arms Research (MSAR) have received requests for the ..
Steyr has announced they will once again be selling the ..
MSAR has announced they have completed their live fire test ..
Is there anywhere to buy just a 16″ MSAR STG barrel?